Let me tell you about this file cabinet. I got it from the free listings on Craigslist a couple years ago. (My secret to getting something good for FREE off Craigslist? Stalk the site or use a CL phone app and the minute you see something you want listed for Free, jump in the car and drive like the wind.) It was a not-so-tasty beige, which is fine for a bland office, but not fun. Not fun at all. Enter Krylon’s new Dual Paint, which is a spray paint and primer in one can. I picked my favorite color, True Blue (or as I affectionately call it, “Ikea Blue”), and went to work on my old file cabinet. I should tell you, I have had this file cabinet in my garage for three or four years. I put it in my office back when I picked it up for free, but it was so ugly that when we moved, I never moved it from the new garage back into the house. 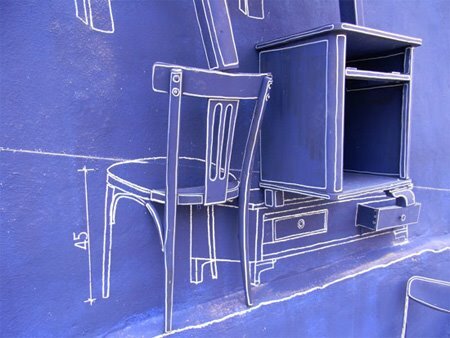 A couple years ago, I found this blueprint-inspired art installation and I have always wanted to have a piece of furniture that looks like this. I love cobalt blue, and I think blueprints are so cool! 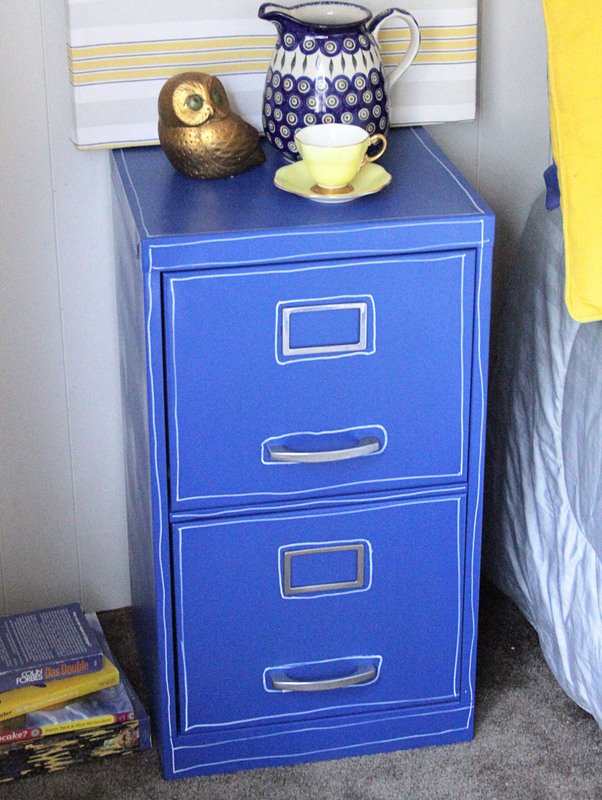 I am not brave enough to paint a room this color (yet), so I started small, with my file cabinet. Spray painting is very easy. Anyone can do it, BUT there are a few simple steps you should take to prepare your project to ensure that your spray painting experience is as successful as it can be. Wear gloves before you spray! With Krylon Dual Paint, you don’t have to prime your surface, but if you are using another kind of paint, you will get the best results if you prime first. 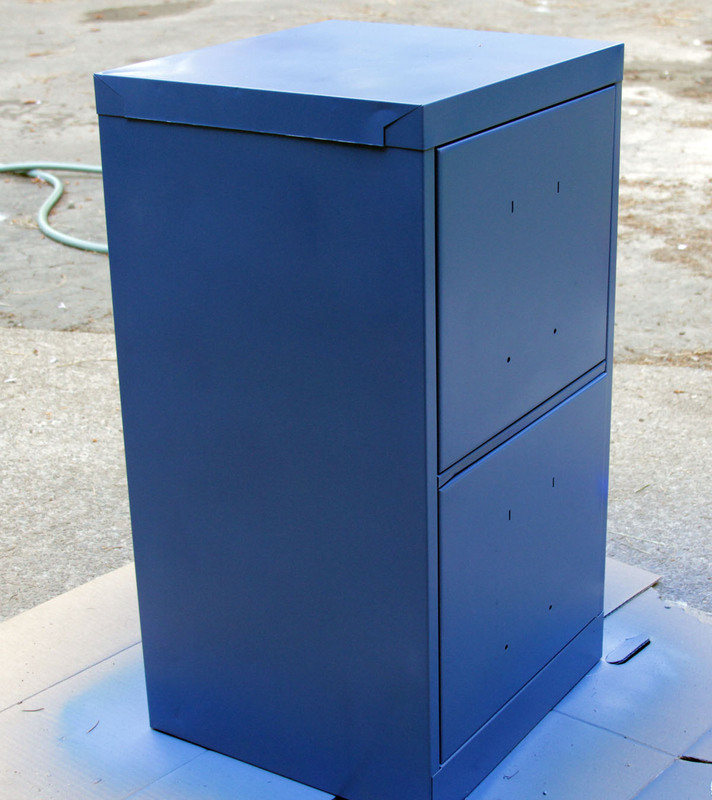 I spray painted the file cabinet with a single can of Krylon Dual Paint in True Blue. This was the most successful spray paint experience I have ever had. The spray paint went on evenly and a single can provided full coverage for my two-drawer file cabinet. After the paint dried, I added white pinstriping with a paint marker. I wanted the stripes to look hand-drawn, so I didn’t use a ruler or any masking, but if you want perfect lines, I suggest masking out your area with painter’s tape and using acrylic paint instead of a paint marker. Start your pinstriping on the back or side of your furniture so you can get a feel for how the paint marker works on a side that won’t see as much prime-time action. I love how this file cabinet turned out — it went from an unloved piece of junk in the garage to one of the most stylish pieces in the house. I am going to use it as a bedside table. And if it’s not too matchy-matchy to have more than one blue pinstriped piece of furniture, I might just have to give the old blueprint treatment to some yard sale furniture finds this summer. Krylon sent me the new Dual Paint to try out. Check out their latest promotion, The Dual Duel, where Krylon is looking to find The Ultimate Restorer. To win this title, enter your spray paint restoration project and encourage friends and family to vote for your project as their favorite for their chance to win too. I painted giant flowers on it when I was about 16, but it’s time for something different. Ha! It DOES look a bit like the Tardis! I love it though, very nice job! @Kelly, I have been wanting to make a Tardis headboard (geeky, i know), so I was pretty excited when I realized how Tardis-like this file cabinet is! Kinda looks like a cartoon. I love it for a kids room. Just learned something new (had to look up Tardis)! 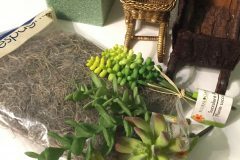 I saw this on Apartment Therapy and wanted to come over and tell you how great I thought this was. Wish filing cabinets were sold already looking like this! Thank you for taking time to say hi! I appreciate it. 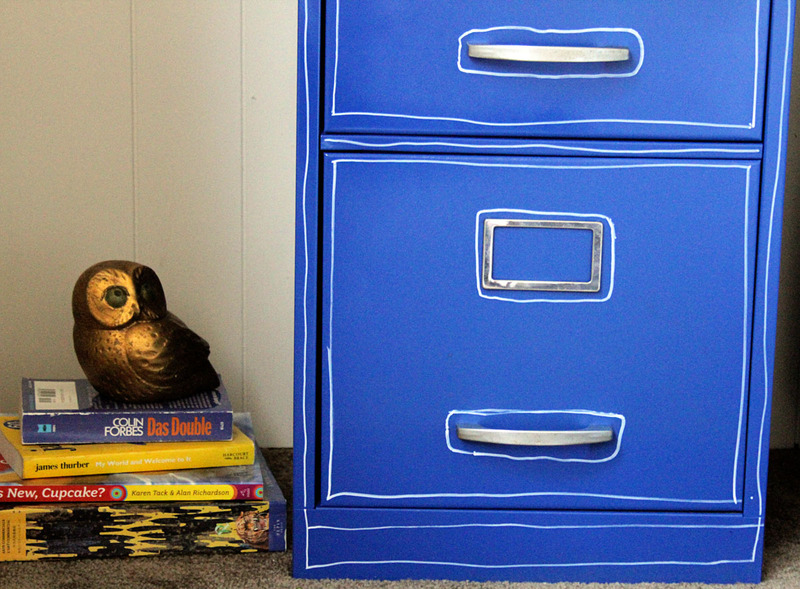 The blue filing cabinet project was so instant-gratification. The whole project took less than an hour! This is awesome! 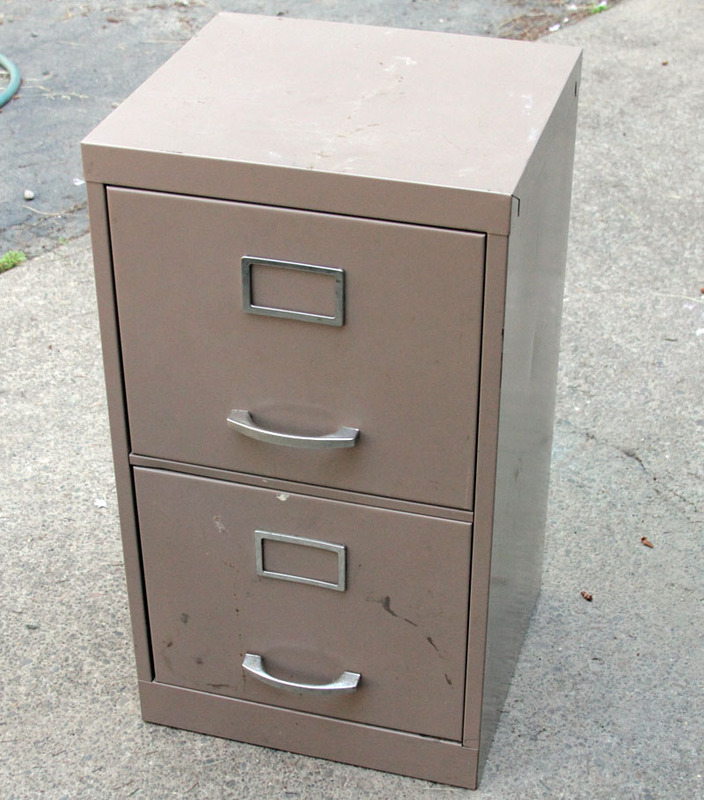 I love that art installation, and your filing cabinet — very clever. Do a chair next! That is cutest little file cabinet I’ve ever seen. Love the way you drew on the stripes. So clever! Very Cool! 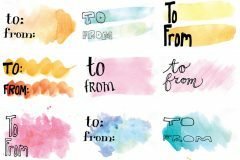 Also I liked the links to all the other blogs doing their own projects with the paint. 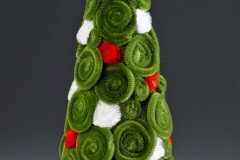 I find a lot of neat blogs via DSC! DId you use glossy finish? That’s the only finish I can find in the Krylon True Blue and I haven’t been able to locate the Dual Krylon yet. I love this look. Please disclose the paint details. @Dewiz, yes, the True Blue was the glossy finish, but it turned out more satin. Thank you so much. I’m excited to see how everything turns out. 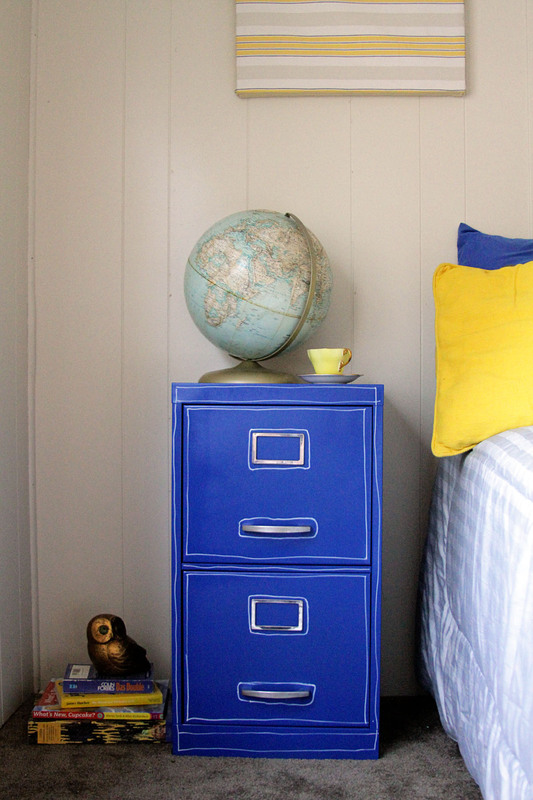 This is a perfect and cheap project for a teen room/college dorm!!! I’m in the process of gathering ideas for my daughter’s room and this is definitely one I will be doing!! and I agree – the pinstripes give it a more whimsical feel!!! Very cool! :)Thanks so much for the inspiration!! How or what did you do to the inside of the drawers? Just curious and seeing what ideas are out there if you did do this for a kids room and how to make those drawers a bit more friendly for organization? Thanks so much for all you do, i definitely visit the site daily. 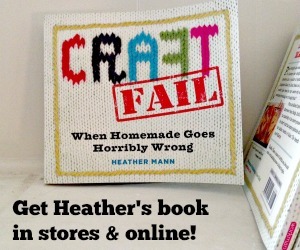 LOVE,LOVE,LOVE this post – *gears turning*! This is so darn cute, I love the way it turned out. I love furniture with a sense of humor, and this definitely has one. 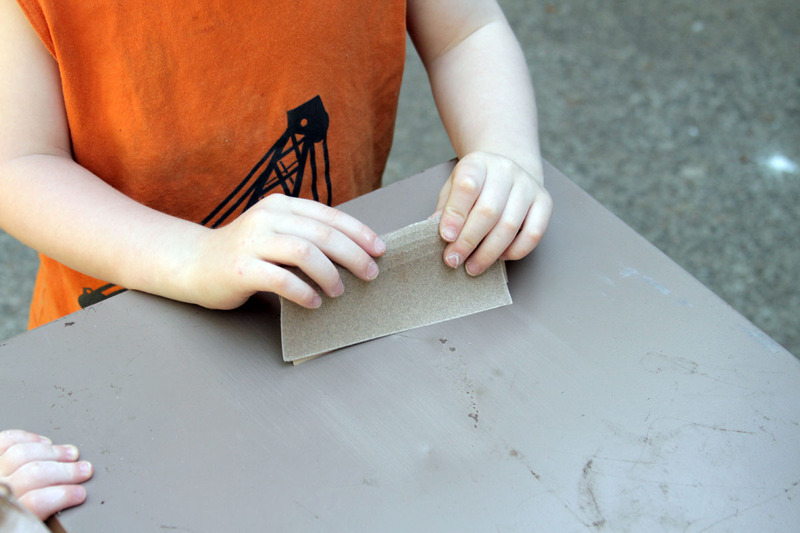 I am linking up a favorite Krylon spray paint project of mine. Oops, collection closed. I will try to link up next time you have a party! Of course. I love it! I love this. I’m going to buy the materials to paint tomorrow! Thank you. 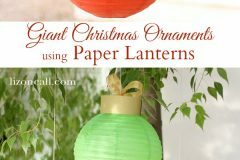 I love the simplicity and the easy DIY! I just made my own with your inspiration! used Krylon Dual Paint in black, and outlined it with a white paint pen. Can’t wait to put it in my office! thanks for the idea and techniques! Thanks for posting this! I just finished making my own and it is perfect for my office! Took no time. Hooray!